So I got the first round of edits back for Finished being Fat. It has confirmed what I have long suspected -- I don't have any clue how to use commas. And judging the contest entries, I don't think I'm not the only one. Some people use commas like sprinkles, liberally dotting them around like decoration. Others have the opposite problem, the dreaded run on. When you read through your own work, it's not really that big a deal. You know your own voicing, you know where you meant to pause. But when you read other people's work, you need those phrasing road signs. I still have a long way to go, but here are some comma guidelines I have picked up. * Use a comma when starting with an introductory action. Example: Jumping of the cliff, Jaime prayed for a miracle. * Use a comma to separate to short but independent thoughts with a conjuction. Example: The man was gorgeous, but he was a little tall for my tastes. * Use a comma to separate 3 + items or actions in a series. Example: She ran, walked, and limped her way across the finish line. * Use a comma to set off parenthetical elements, parts of the sentence that aren't strictly necessary and could be removed. (see what I just did there?) Here's another example: Your mom, the oldest and grumpiest lady I have ever seen, slammed the door in the girl scout's face. * Use a comma between complimentary descriptions. I like the rule that if you can put an and in between them, you could probably use a comma. Example: He was tall, dark, and mysterious. As opposed to the She was a little old lady. Notice you don't use a comma in the second example. * Use a comma for a break in thought, or to add contrast and set a piece apart. A lot of people think this is the old, put a comma in wherever you pause when reading. Not so, there is an actual reason for it. Example: I didn't like what he had done, though not my problem anymore. There are many more uses and misuses of the comma. But these are the ones I find myself abusing the most. What about you? Are you a comma-kaze? Or a grammar nazi that has total comma control? Wow this is really helpful! Thank you! Good advice. Commas are by and large a mystery to me. Good thing for editors! Yes, I feel I have a lot to learn in the comma world. I swear a book could be written on it. But I do have to question your example of the little old lady. I thought if you had two adjectives modifying a noun that a comma needs to be used. For instance, talking about a little, old lady. Or a large, green tank. After all, she can be little and old, and the tank can be green and large. Where am I going wrong on this? Would you ever write that the woman was little and old? Or are you bring those words together into one term. A little old lady. You don't want to emphasize that she was little and old. You are joining the two into a singular vision. 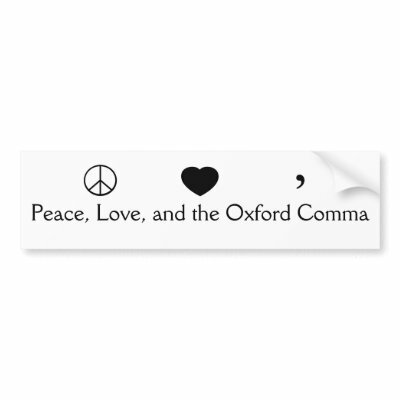 "Some people use commas like sprinkles, liberally dotting them around like decoration." That makes me laugh, mostly because it is so true.